Three people were dead after a deputy-involved shooting Saturday night and head-on crash Sunday morning just a few miles apart in Valley Center. Just after 7:30 p.m., Escondido Police responded to a disturbance in the 1400 block of Timber Glen in Escondido. They spotted a possible suspect fleeing the area, and chased the vehicle into Valley Center before asking for assistance from San Diego Sheriff‘s deputies. When the vehicle approached Valley View Casino, the suspect stopped at the entrance and confronted officers. The suspect was shot and died later at a local hospital. Just hours later, deputies were called to Harrah’s Rincon Casino around 1 a.m. by a report of a stolen vehicle. A stolen black Honda Accord was seen leaving the casino parking lot, and a sheriff’s helicopter followed it. About a minute into the pursuit, the Accord crashed head-on into a white Honda Fit on Valley Center Road at Rocky Top Lane. The driver of the stolen Accord and one passenger were pronounced dead at the scene. A third passenger was hospitalized. 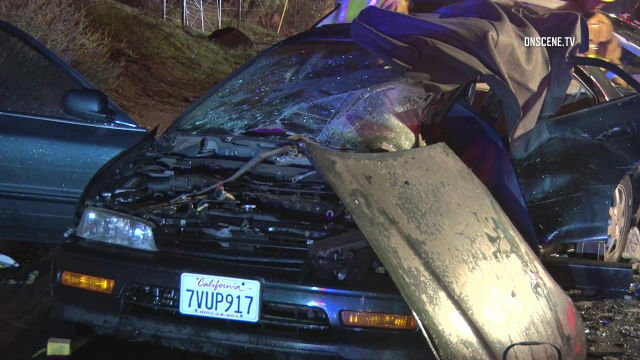 The driver of the other vehicle, a woman, suffered major injuries and was transported by air ambulance to Palomar Medical Center. There was no indication that the two fatal incidents were related.